No one can tell you that capitalism is working, and after several decades of global neoliberalism (a brand of de-regulated hyper-capitalism spawned in the mid-1970s to secure the continuing rule of the rich), no one can tell you that “socialism” is a barrier to prosperity anywhere. As if to really drive the point home, a world devastated by neoliberalism is now confronted with a crisis of capitalism so deep that we can’t yet find the bottom. If you haven’t been reconsidering that whole “there is no alternative” thing at least a little bit, then you probably were on the receiving end of Bush or Obama’s bank bailouts. Of course, this is no phenomenon limited to mainstream media. Everywhere, the writings of Karl Marx are flying off the shelves. My casual conversations with strangers frequently take an anti-capitalist tone sooner than planned. Just a few nights ago, I attended a speaking event at Ebenezer Baptist Church featuring Angela Davis and heard hundreds of people (some activists, some not) cheer suggestions that we “have a discussion” about replacing capitalism with something else. But alas, the revolution is not around the corner…people in the US aren’t joining Solidarity or any other socialist group in droves. Worse than that, the specter of reaction also haunts capitalist crisis today, just as it has in the past. People don’t automatically move toward our solutions–other “solutions,” like scapegoating immigrants for job woes, are also out there. One local example in Atlanta: homeowners near my neighborhood have organized a group called “ATACC” (Atlantans Together Against Crime and Cutbacks) to fight rising crime. This small group of moderately wealthy whites has gotten no lack of attention from local media and politicians in their effort to increase police presence in a rapidly gentrifying area of the city. See Isaac’s upcoming entry to the webzine for more information on ATACC and the effort to build alternative organizations reflecting our solutions. This state of affairs, where many are questioning and few are moving (that is, into movements and red groups, not simply out of their homes), requires that we talk strategy. How are we going to move from crisis to alternative? Tellingly, this is the focus of the series in The Nation–not just “reimagining” socialism as a vague alternative, but highly relevant discussions on meeting the present crises to build the system we need. As the diverse array of authors “reimagine” socialism, we see many points of unity and debate emerge–far too many for this busy graduate student to summarize in full. While I honestly think the series is great, I have to put out a short disclaimer for webzine readers: some of these articles are explicitly reformist and some don’t even appear to “reimagine socialism” at all. Saskia Sassen’s entry, “An Economic Platform That Is Ours,” presents a policy proposal for infrastructure development that would create jobs on the cheap. There is no insistence on movement-building, as if we just need to convince the capitalist state of our superior ideas. To make this convincing easier, Sassen reassures readers that this would not challenge capitalism and would not require any sort of revolution. 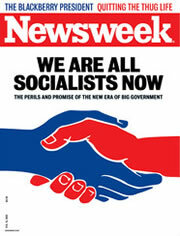 One wonders how this remarkably unimaginative article, which doesn’t even include the word “socialism,” made it into the series. Mike Davis enters the arena to cast both of these problematic strategies as utopian in the negative sense. He writes, “A peaceful, just-in-time transition toward low-carbon, rationally regulated state capitalism is about as likely as a spontaneous connecting-the-dots of neighborhood anarchism across the world… Simply extrapolating from the present balance of forces, one most likely arrives at an equilibrium of triaged barbarism, founded on the extinction of the poorest part of humanity.” One fundamental thing to keep in mind when we “reimagine” socialism is the importance of having a sober analysis of actual conditions and knowing how to most effectively engage people in the real world. It’s not enough to simply imagine desirable alternatives to capitalism without recognizing viable paths to getting there. According to Dan La Botz, socialists should “work to build and to support militant minorities” that are integral to carrying movements further toward realizing our imagined alternatives. “We know from experience that when large numbers go into motion,” he writes, “they develop new tactics and strategies, as well as the new political alternatives without which we cannot succeed in changing this society.” To do more than just “reimagining,” we’ll need to organize as socialists and get serious about strategic movement-building as the principal path toward actually revolutionizing society and creating a more just, humane, peaceful, and sustainable future. Furthermore, an anti-racist and feminist orientation for all organizations is paramount. I note this last not as an afterthought, but as something absolutely worth remembering. Lisa Duggan calls for an intersectional “reimagining,” rejecting “the leftist habit of ignoring those on the manufactured political, social or cultural margins [which stand] in the way of making something new happen, something worth living for–for all of us.” Without this, we’re sure to miss the mark in building anything worth imagining. Oh, but there is so much more. This is already a rich series, and I’m eager to see what else develops. While I’m happy to hear that bookstores are having trouble keeping Marx’s Capital in stock, I’m even happier to see more accessible conversations about socialism proliferate mainstream and liberal news media in the US. I imagine that these folks taking their first foray into Capital are feeling a bit ripped off at least by the time they get to chapter 3. Marx’s theories remain crucial to explain why crises occur and why they are inevitable under capitalism, but these conversations are more likely to introduce readers to the immediate questions of how to organize for socialism. I suggest we use them to kick off conversations with activist contacts. In Atlanta, one member of a local radical history group has already mentioned to Solidarity members that they’d like to host some discussions on the series. Since the articles are all on the web, they’re easy to e-mail, tweet, blog about, post on facebook, whatever. What do you think of the series? How do you think it can be used in discussions about socialist organization? Post your comments! 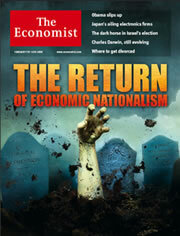 The Nation is not a liberal magazine. All of the authors listed above (from Ali to Wallerstein) are leftists. All the editors at the Nation are leftists. The magazine is still trying to prove the innocence of Alger Hiss! You know, I think I am actually more stubborn than “imaginative” on these questions. I’m not even sure if that’s actually what we lack, though–our answer to inequality, crisis, etc. has always inherently been more “imaginative” than that of the ruling class! I think what’s more important is that many liberals and some conservatives are being disabused of notions that crises are “mistakes” in the management of capitalism or that we can continue basing our subsistence on the wasteful production of commodities while the planet burns up, to name just a few. Of course, people need “help” in drawing these conclusions sometimes and The Nation is playing an uncharacteristically productive role in this process now. I really don’t see why you’d promote that Proyect article that you link to. A “developed critique”? That sort of thing is embarrassing to ortho-Trots. He tries to convince gullible readers that Albert or Hahnel proposed “parecon” as a strategy for overturning capitalism. But where’s the evidence for that absurd charge? What he really means to say is, “Albert’s not a Trotskyist! Albert’s not a Trotskyist! Albert’s not a Trotskyist!” Trotskyists should ask themselves: have these sorts of condemnations ever been convincing to non-Trotskyists? I think that if Trotskyists want to be taken seriously they have to leave behind the crude polemical mode of “debate” that they picked up from immersing themselves in the early Comintern internal culture. Regular people find it very off-putting. great post! 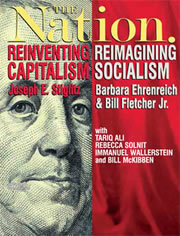 I’ve been recommending the nation series left and right, so to speak, and will add your response to the recommendation. I also think that the articles in the series are a very good length to use in undergrad classes and I am thinking of using them that way this semester. What do I think about the series? That you should submit an article to it! This was really a great summary — I hope at the very least you’ll write a second installment commenting on new pieces as the series grows.